The Temple of the Ancestor Moths is a large cave north of Cheydinhal (quest-related). It contains five zones: Ancestor Moth Crypt, The Temple of The Moth Halls, Catacombs of The Temple of The Moth, The Caverns of The Moth, and Shrine of The Moth. This cave contains 21 Cairn Bolete plants and 67 Wisp Stalk plants. 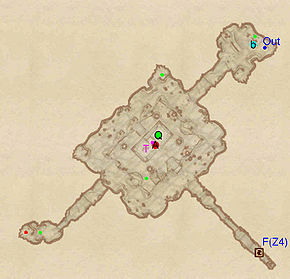 If you open door D in The Temple of The Moth Halls before starting the Turning a Blind Eye quest it will execute the command SetStage TG08Blind 6, starting the quest prematurely. As a result, the next time you talk to Methredhel she will give you a message assigning you the quest, whether or not you are in the Thieves Guild. If you are not in the Thieves Guild when this quest has started you will not be able to receive further detail from the Gray Fox; all he will say is "Don't you have something to do?" and close the conversation. It is not recommended to proceed to complete the Thieves Guild quest line this way, as it can cause a major bug and freeze your game at the end of The Ultimate Heist quest; see that quest's bugs for details. This location's map marker (M on map) is named Temple of the Ancestor Moths (editor name TempleoftheAncestorMothMapMarker). The entrance door is ENE of the marker, 110 feet away. The Crypt merely functions as the gateway to the secret catacombs, home of the retired Blind Moth Priests; it contains little of interest except for a barrel with a few torches, an inactive altar and a roll of cloth. During the related quest, Brother Holger can be persuaded to unlock both the entrance and door C, leading to the zone The Temple of The Moth Halls. The Moth Halls functions as the dining and work areas for the Blind Moth Priests and is completely covered in darkness. This is where they manufacture rolls of cloth spun from the silk harvested from the Ancestor Moths, often praying in the very first room of the zone. Upon entering from door C, a hallway leads down to the first room, where up to two priests can be found praying; they will protect the Moths at all costs and attack you, so make sure to go into sneak mode before proceeding. Go through to wooden door and make a choice at the intersection; the door straight ahead leads to the dining area with plenty of food and a potion chest, but also the chance of more priests, depending on the time of day; regardless of your choice you will end up in another tunnel leading north. 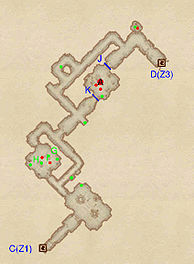 The next intersection presents you with a similar choice; the locked door straight ahead leads to the working area where a Blind Moth Prelate resides at A, while the tunnel to the left provides a workaround and access to a better loot chest (green dot on map) than that in the working area. 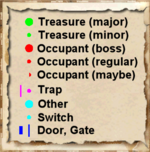 Avoid or kill the unique rat residing in the tunnels, and proceed forward, claim the contents of the chest inside the broken wall, then enter the next zone, Catacombs of The Temple of The Moth, through the locked door at D.
The Catacombs are where the Moths are bred and also functions as the sleeping area for the residing priests and prelates. Upon entering from The Temple of The Moth Halls through door D you are immediately faced with an intersection; continuing straight ahead will bring you near to the locked wooden door at G, while taking the right tunnel will lead you through a storage room with various foods, a chest with potions and access to the locked door at H. Regardless of your choice, you will end up in the sleeping area (b) of the priests and access to a minor loot chest. While optional, the southeastern tunnel leads to the breeding spot of the Moths; the insects are buzzing above a concentration of Cairn Bolete plants and Wisp Stalk plants, overseen by a priest and a prelate. The pile of crates hides a chest and provides access to the upper level where another chest rests against the northern wall. Back in the sleeping area, locate the northeastern tunnel leading to door E and use your lockpicking skills or the Catacombs Key to unlock the door to the next zone, The Caverns of The Moth. No priest or prelate ever set foot in the Caverns and rightfully so, as it is loaded with traps and functions purely as a passageway to their most guarded treasure, Savilla's Stone. Upon entering from door E, make your way through the narrow tunnel and beware of the tripwire at K, triggering a set of swinging maces (L) just before the first intersection. For the easiest exploration, proceed forward and fight the leveled enemy blocking your path. At the next intersection, take a quick detour to the right and loot the chest near the rock wall at N. Ignore the wall and backtrack to the intersection then take the other path towards a room filled with Spikes (I). 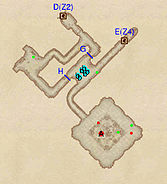 Jump over the spikes, loot the chest and proceed to the last intersection and another enemy; pick the left path which leads to door F, the entrance to the last zone, Shrine of the Moth. 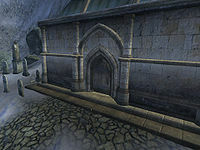 The Shrine is a big underground chamber where the Priests keep Savilla's Stone (Q), and it is guarded by a Blind Moth Prelate at A and a Dark Welkynd Stone (T) that will fire at you as soon as you jump into the lower level near the altars. There are several strategies for grabbing Savilla's Stone (see this section for details). 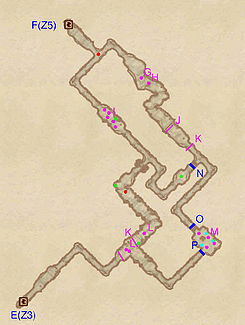 A chest with potions rests in the northwestern corner of the upper level, while a tunnel leads west from the lower level, to a room with a minor loot chest. After claiming the Stone, locate the northern tunnel which leads to a bedroll (b), a few common books and a chest holding the informative Instructions: the Gray Cowl. Finally take the ladder at Out, which will bring you back outside. 1 door (at Out) leads outside. You emerge at the well behind the monk's quarters. It is one-way, you cannot use it to re-enter the Shrine of the Moth. This page was last modified on 12 August 2018, at 12:45.